Maplehurst Fence Company specializes in all kinds of wild game fencing and has installed fencing systems across nearly half of our great nation. Whether you have deer of any kind, ostrich, bison*, whatever, we can basically keep it where you want it. Or where you don't want it. Maplehurst Fence Company & Texas Fence Connection are pleased to announce that we have joined forces to create the most qualified and experienced wildlife fencing team in our industry. With more than 28 years of combined high tensile fencing experience, we have the personnel, equipment and expertise to provide the best solution for all your farm, ranch, commercial and industrial fencing requirements. We specialize in the design, engineering, and construction of Solid Lock, Tight Lock, and Stay Tite high tensile galvanized wildlife fencing. 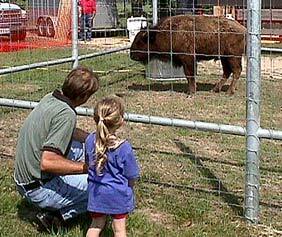 *Let's face it, a 1,500 lb Bison will stay behind any fence he is willing to stay behind. Period.